The social interaction flash cards were introduced here; Fuzzball tried again here. As I mentioned previously, "Dainty" D.F. French and I came up with this flash card idea together. If you know D.F., you can tell he wrote this episode--he's able to harness the power of his own neuroses to come up with Creature's crazy-but-logical-sort-of thought processes. 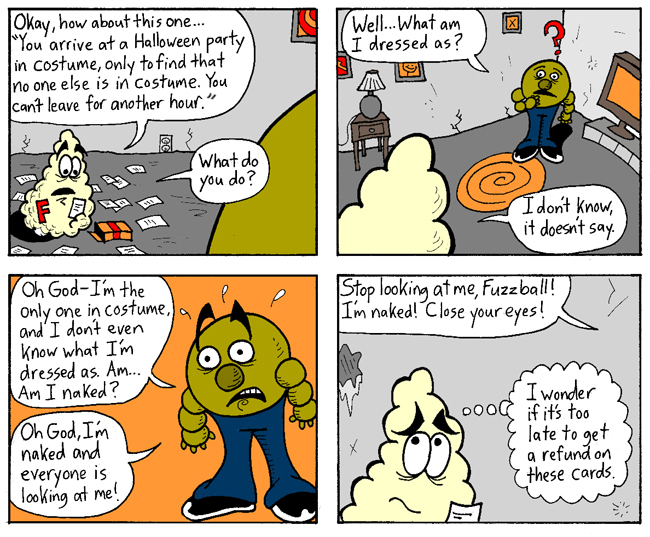 I'm glad I asked him to write this series of strips, because his Creature is way funnier than mine would have been. Next Week: Creature sinks deep into self-pity! Want to know more about this kooky cast of characters? Check out the Great Jumping-On Point for New Readers!